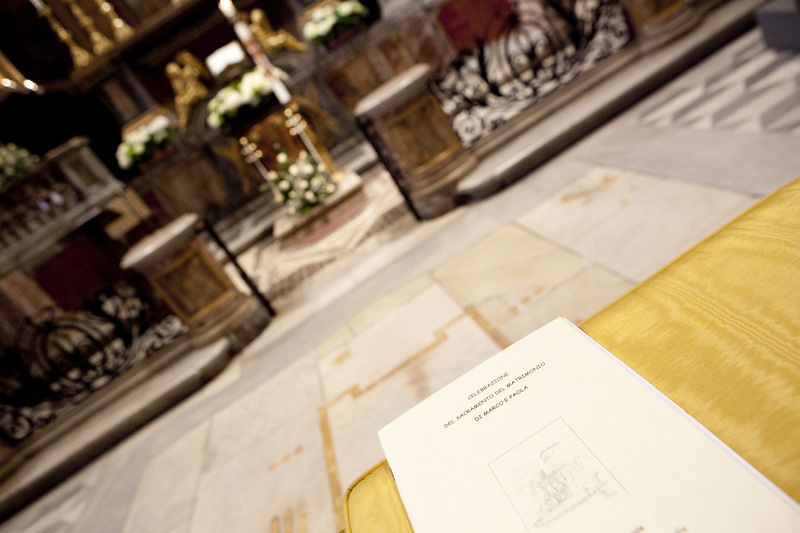 We can assist you with all administrative paperwork, whether you are considering a religious or civil ceremony in Italy. Civil Ceremony: According to Italian law, civil ceremonies can be celebrated only in locations recognised by the Italian authorities: town halls, villas, castles, cloisters, and are conducted by a Council officer. Religious Ceremony: Roman Catholic religious ceremonies are recognized under Italian law as legally binding, and consequently by any countries recognized by the Italian government. There is no need for any additional ceremony or paperwork. Catholic ceremonies are allowed when at least one of the spouses is Catholic. Symbolic Ceremony: They can take place almost anywhere; will have no official value, and you will have to arrange your legal paperwork at home before travelling. Renewal of Vows: It is a great way to celebrate a special anniversary. We will assist you organizing your Renewal of Vows with a symbolic or religious ceremony, which can be held in a private chapel, garden, castle, villa, etc. For Catholics, the wedding is a sacrament, and needs an additional paperwork (in parallel to the civil one) which generates another Nulla Osta. This Nulla Osta is generated by the Bishop of the area where the couple lives, and is sent to the local Bishop where the wedding will be held. To obtain the Nulla Osta at your place, you will need a pre-cana preparation and at least 6-10 months. Inquire your local priest before to ask him about the exact requirements in your parish. He will initiate the process to obtain your Bishop’s Nulla Osta. Preparation is important for aCatholic wedding, so please allow the due time to it, speak a lot with your Father at your local church as a first thing, we are happy to help you and counsel but your church is the first point of reference until you have the fist Nulla Osta released. All the documents will have to be ready and sent to the Italian Bishop of reference at least 2-3 months before the wedding. For this reason we suggest you start collecting information about the whole process in your country with your priest no later than 9 months before the wedding. Most of the bishops in Italy are not so keen in accepting weddings of non residents, so be advised that your wedding will be able to be celebrated in very few areas. Both, bride and groom, have to be either single or legally divorced or widow. By law, if the womandivorced less than 300 days before the new wedding date, a medical certificate of non pregnancy should be provided to the local court. Bride and Groom cannot be relatives of first or second degree, brother/sister or father/daughter – mother/son not even if the relationship was by adoption or by blood (without legal recognition). Catholic weddings, if one of the two had been married before with a catholic or Christian celebration, a catholic wedding cannot be performed. You can only have a civil legally binding wedding or a symbolic wedding. The only exception to this is if the catholic part got a “Catholic Church Annulment” (nullification) – but this procedure is so long (i.e. years) and most of the times unsuccessful. If this is your case, we suggest you do not plan a catholic wedding until you have a nullification certificate with you, or plan either a civil or a symbolic wedding. If none of you is Italian nor resident in Italy, banns are waived and you just need the Authorization (usually called NULLA OSTA) issued by consular foreign Authority in Italy (for some nationalities consul’s signature shall be legalized by the Prefecture). The legalization is not requested for the following countries (it may apply to some others): Argentina, Austria, Belgium, Croatia, Denmark, Finland, France, Germany, UK (including the Isle of Man), Greece, Ireland, Liechtenstein, Luxembourg, Macedonia, Norway, Holland (including Netherlands Antilles and Aruba), Portugal, Czech Rep., San Marino Rep., Slovakia, Slovenia, Spain, Switzerland, Turkey, Hungary. Alternatively you need the authorization of a competent foreign authority confirmed by the Italian Embassy or Consulate. The authorization shall attest there are no impediments to the marriage. It also shall include the following data: name, surname, date and place of birth, residency, nationality, marital status, paternity and maternity (full names of the parents), birth certificate (when maternity or paternity are not provided on the authorization). Some countries will need other documents on top of the Nulla Osta, as mentioned above, i.e. USA citizens and Australian Citizens. Most of the nationalities will require the couple to meet the Consulate in Person, so please schedule your trip accordingly, as many of the consulates are only in Rome or Milan. Do not worry, we can help you out with all this and send the whole paperwork to the competent authorities to have your marriage registered in your home country. All you have to do is plan to be in Italy some days in advance… but, as we will be there releasing you from any stress, imagine that as an advanced honeymoon!! Insert your nationality and fill the contact form if you want receive any other information about.